The simple-functioning Stirling Motor has a piston in the parallel-configuration and a balanced and quiet operation at over 1000 U/min. In order to visually monitor any of the movements in the apparatus, an emphasis was put on operational transparency was designed into GT04. In accordance with this consideration, the pressurization cylinder, displacement cylinder, and displacing piston consist of a specially designated glass, and the flywheel and gear case of Plexiglas. The crankshaft is mounted with ball bearings and consists of hardened steel, and the connecting rod and crank of a wear-resistant plastic. Due to the constitution of this units components, its operation is very quiet and maintenance-free with a performance of ca. 1.5 mechanical Watts. This model is mounted onto a ground plane, having a large, transparent flywheel and a hardened steel crankshaft with ball bearings. Both cylinder and displacing pistons consist of hear resistant specially designated glass. The connecting rod and crank are made of wear-resistant plastic. The crank web and crank pin are both inset with Ball Bearing, hardened, and polished. The discharge shaft is also hardened and polished. The triangular transmission, cross-bar, and guidance bar consist of an extremely wear resistant, attenuated plastic. The crank case, connecting tube, as well as the cylinder cap consist of a corrosion-resistant aluminum alloy, each having been polished multiple times. To ensure both safety of element function and visualization of the unit?s mode of action, the cylinders and working piston are constituted of a specific safety glass, while the gearbox and flywheel consist of Plexiglas. Unit transforms mechanical energy from the Stirling motor into electrical energy, whereby a light bulb (E 10 socket) is illuminated via an electrical conduction box (max. 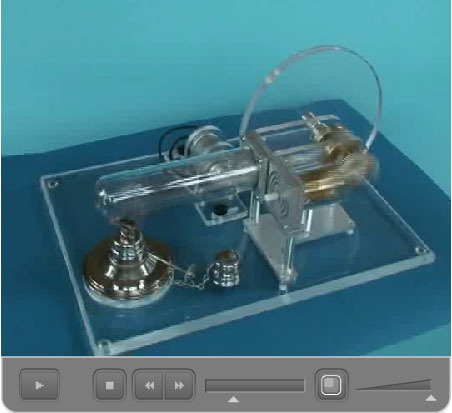 12 V), and the operation of the Stirling motors as a heat pump or as cryopump (with belt). The determination of the operating temperature and the temperature difference with two Instrumentation Supports with bored holes (Ø 2 mm) for the mounting of thermal detection elements. The ground plane is composed of Plexiglas, the upper edges of which are facetted. Secure positioning of the unit is secured by the vibration dampening, skid-resistant rubber knobs on the undersurface of the ground plane. Video GT04 working with Motor / Generator - Unit for browser view.